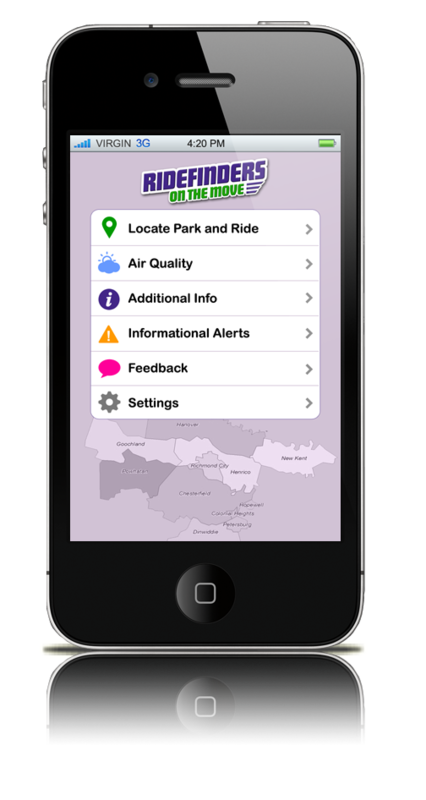 It's now even easier to find the nearest park and ride lot locations with available transit and to stay connected with important news and updates with the RideFinders On the Move mobile app! Or check out the RideFinders - Ridematching & Rewards mobile to find rideshare matches and earn rewards in the greater Richmond, VA region. Simply record your telework, walk, bike, carpool, vanpool, bus, or rail trips in your RideFinders account and earn points that can be redeemed for rewards. Get started today – it's free and easy to do! Locate a nearby Park and Ride lot using built-in GPS. This feature will show the nearest intersection of the Park and Ride lot and available transit and some additional information including parking spaces, lighting and bike accommodations. Receive news, updates and notification alerts of vanpool availability, RideFinders' programs and services, future transportation events, website updates and more! Get the scoop on upcoming promotions! Receive daily air quality forecast. Submit comments and suggestions regarding the use of RideFinders' mobile app. RideFinders welcomes feedback from users to better enhance the mobile app.